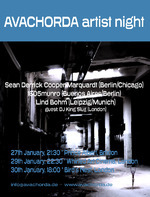 Avachorda, Leipzig/Berlin (Germany) based label starts in 2011 with a bunch of releases supported by a series of 3 concerts exploring the artist contrasting takes on a forever changing world of of sound and imaginary space, with the interests of considering music in a new challenging way, passionately interpreting the signals and connections of patterns echoed on a distant shore, music that seems able to resemble and link together the archaic archives of musique concrete and electronic music in paths choosen by the very few, these artist will surely take you out of the comfort zone. 1605munro's (Berlin) album Lunapark celebrates the art of deceleration, like a trip in music from Buenos Aires to Berlin where Jazz meets Filmmusik meets minimalism. Feat. Takeshi Nishimoto, Robert Fripp, Daniel Erismann, Alex Anthony Faide, Tetsuya Hori, Lenka Župková, Hernán Nuñez, Hidekazu Gondalïa Wakabayashi, Jorge Haro, Claudio Milano, Miwon. Sean Derrick Cooper Marquardt's (Berlin, Chicago) album Gesang der Geister is the masterpiece from the developer of the accidental guitar method. Deep, ritual and intensive. Burning electronic sighs coming from under everday iceworld. Contemporary improvised chamber music for the 21th century. Featuring 1605munro, Lind Bohm (premiere of his project „Bewegung 3. Oktober“) & Sean Derrick Cooper Marquardt and special guest DJ King Slug.